Those were the exact words from the presenter of this video, and we couldn't agree more. The Challenger SRT Demon is probably the most unholy muscle car to roll off Dodge showrooms these days. It's the widebody, bonkers version of the Challenger that oozes with unadulterated power and designed to eat asphalt in a drag strip. 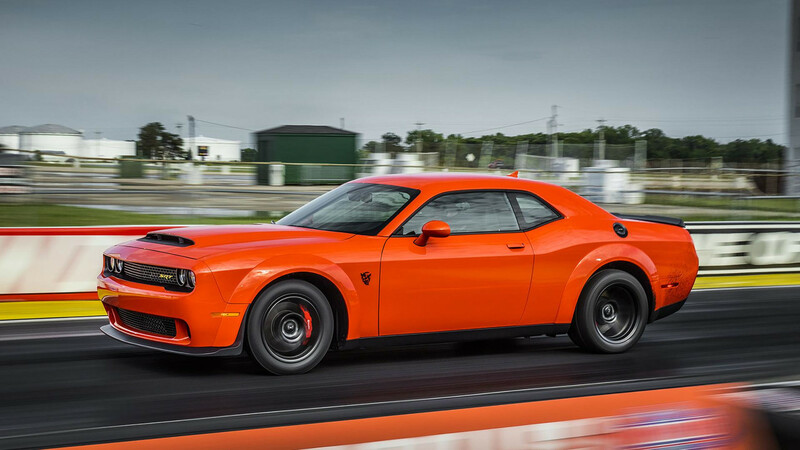 But before its infernal birth, there was the Challenger SRT Hellcat – equally furious and diabolical, but not when you get to see their spec sheets. Pitting the two in a half-mile drag race might sound pointless, but just like what the presenter said, we still want to see it with our own eyes because otherwise, you wouldn't be on this page. Before you proceed and watch the most unholy drag race, let's put the numbers of the siblings to see their differences. The Dodge Challenger SRT Hellcat is propelled by a 6.2-liter V8 engine with a 2.4-liter supercharger. This setup allows the Hellcat to produce 707 horsepower and 650 pound-feet of torque. With these output figures, the Hellcat can reach 60 miles per hour in just 3.6 seconds from a complete standstill. The Dodge Demon, on the other hand, has the same V8 power plant but with a slightly bigger 2.7L supercharger, enabling it to produce 808 hp and 770 lb-ft torque when using 91 octane gasoline. Using its red key and filling it up with 100 octane gasoline or higher, the Demon can squeeze out up to 840 horses with the same torque figures. It weighs 4,254 lbs, which is 215 lbs lighter than the SRT Hellcat. With these, figures laid out, the Demon can reach 60 mph in just 2.3 seconds. With around $20,000 price difference between the two, are the improvements in the Demon worth the hefty price gap? Watch the video on top of this page to find out.